A story walk, featuring Flashlight Night (Boyds Mills Press, 2017)! 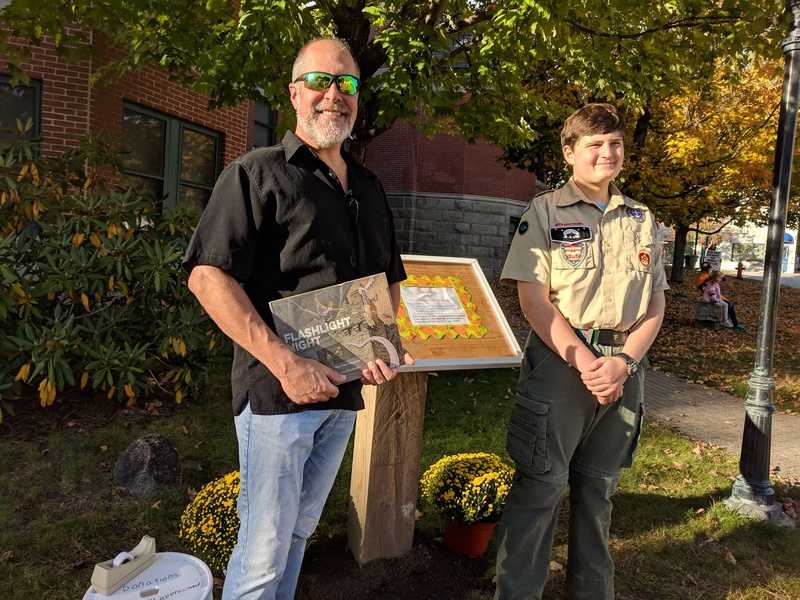 When Eagle Scout Alex Swanson decided to earn a badge for community service, he thought creating a story walk along the newly-opened rail trail in town was a good idea. 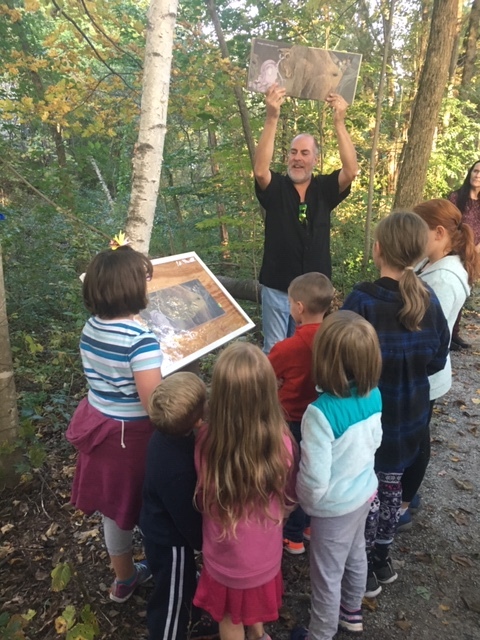 So he contacted the local rail trail organization and our local library to see what could be done…and pretty soon, the project was off and running! This past Friday, Alex, rail trail reps, and library volunteers put the finishing touches on 21 podiums featuring chronological spreads of my picture book, positioned from the library lawn down the street to the rail trail, which then continue into the woods along the rail, ending just 20 feet away from one of the state’s few remaining wooden covered bridges. Yes, this is New Hampshire at its finest! 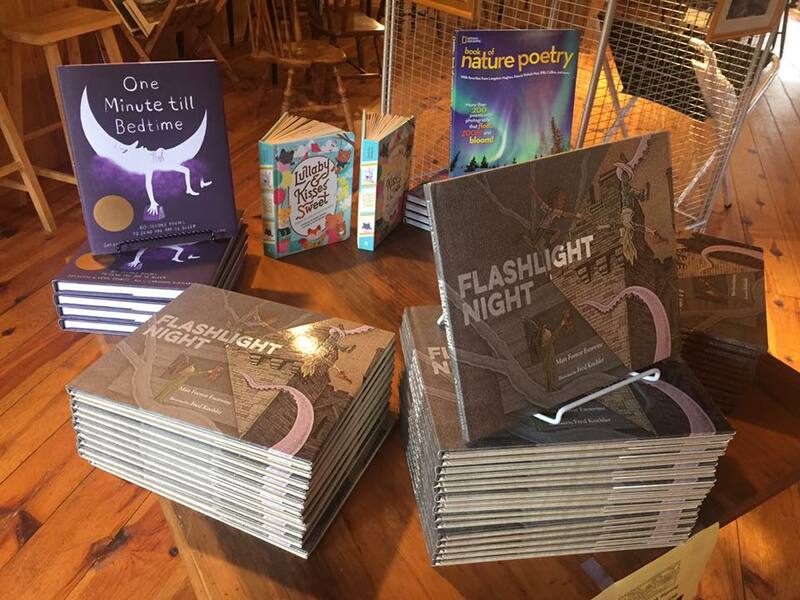 I was so honored that they used Flashlight Night as the inaugural picture book; granted, I live in town, but they could have still chosen any book they wanted, yet they chose mine. 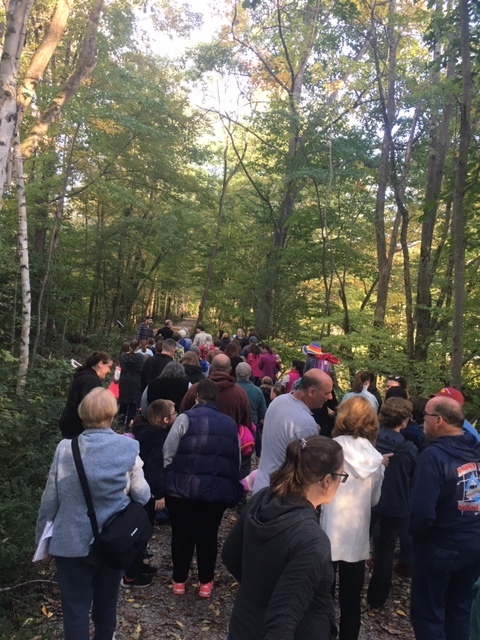 I was also stunned (as were the organizers) by how many folks showed up for the grand opening of the story walk at 5pm on Friday. We had advertised it around the area, yet had no idea what kind of crowd we should expect; we hoped for at least a few families. 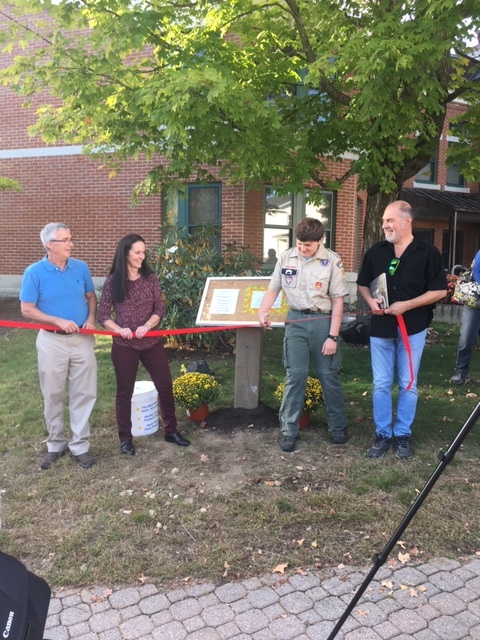 As it turned out, over 50 individuals – kids, parents, grandparents, neighbors – attended the grand opening, and none of us could have been happier! (l-r:) Rail Trail representative Tim Blagden, Pillsbury Free Library children’s librarian Sue Matott, Alex Swanson, and some bald dude who wandered into the frame. After each of us said a few words, I led the group down the path to each station. I would read the appropriate passage from the book, then allow members of the group time to look over each spread. 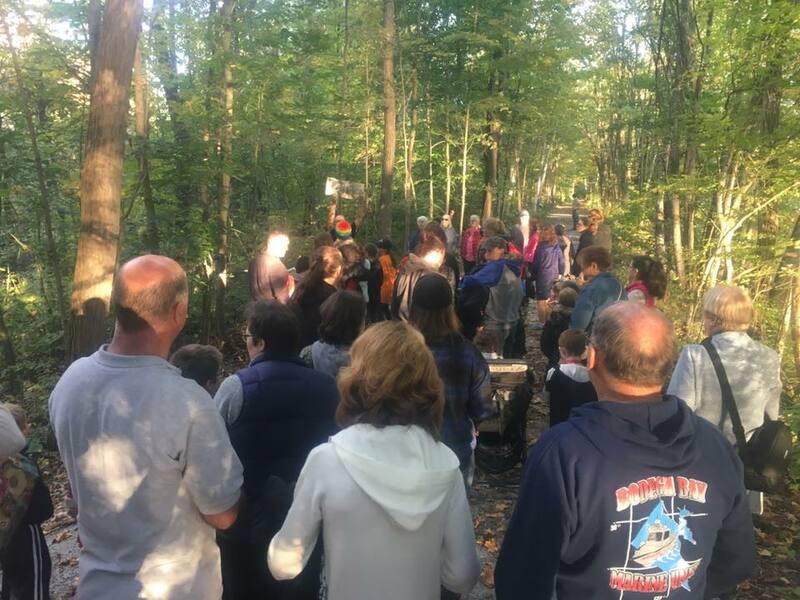 Some folks had never heard of a story walk, so we wanted everyone to understand what Alex and the rest of us were doing, and to enjoy it as much as possible. By the way, Alex is still attempting to cover his costs of putting this together, so if you’re interested in helping him out by donating a few bucks to the cause, I’m sure he’d appreciate it. In fact, he has a GoFundMe page available for donations. It was surreal, I’ll tell you that. 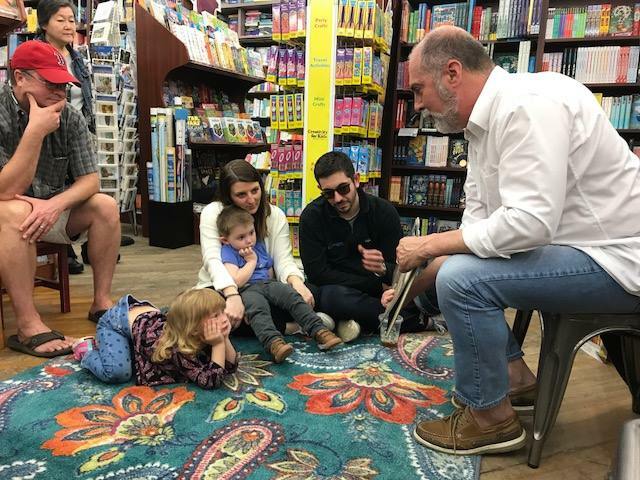 I know of several “flashlight night” events around the country, but when an author gets to be a part of one in this way, it’s quite humbling. And by the way, if you’d like to either create a story walk or host a flashlight night in your area, please don’t hesitate to email me at the address at the above-right, and I can get you in touch with the folks who organized this! My book will be available for viewing for about 3 months or so, and then another book will take its place. Here’s to many more flashlight nights…with many other stories! I make a living using my imagination. Whether it’s a poem, a picture book, or even a blog post, I love to stretch my mind and see what kinds of unusual, surprising, and creative stories and images I can come up with. But I have to admit…it is very, very hard for me wrap my head around the fact that my debut picture book is ONE YEAR OLD today! 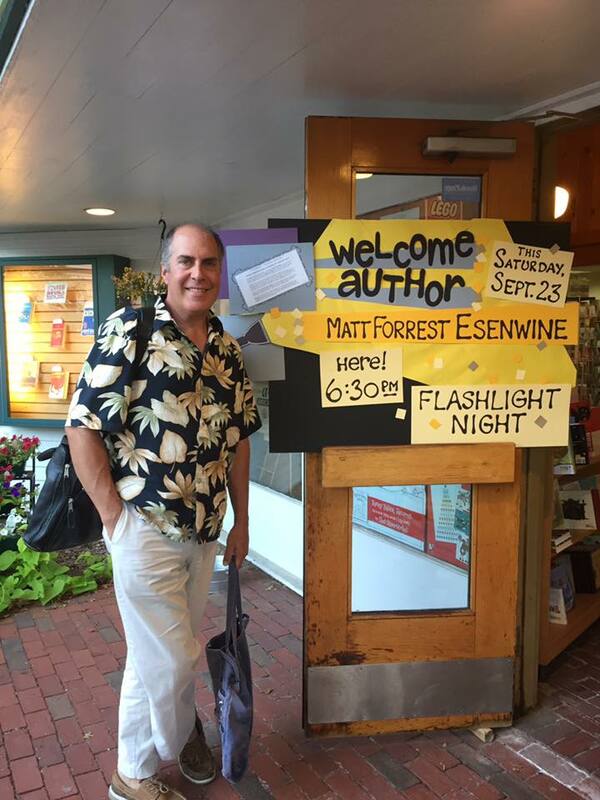 Flashlight Night (Boyds Mills Press) was officially published on Sept. 19, 2017 – and I could never have imagined the response it would receive nationally. I knew I liked it, of course; I knew illustrator Fred Koehler had done a phenomenal job on his end, and I knew our editor, Rebecca Davis, had performed an amazing juggling act between the two of us – balancing my story with the story Fred was telling via his illustrations. 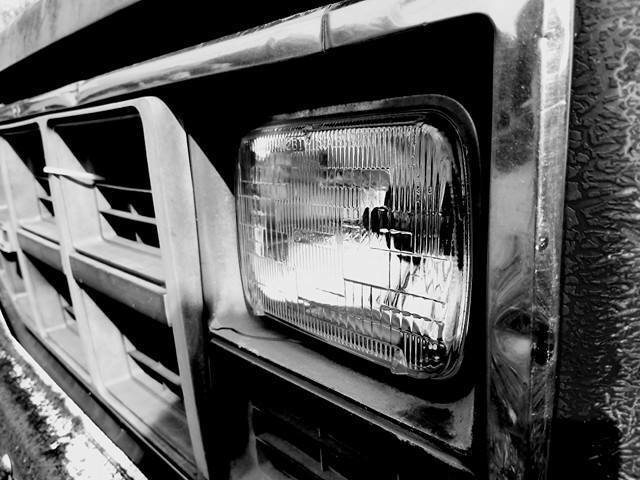 August, 2014: Staring at my car’s headlights while driving home late at night from an SCBWI Meet-Up in Westford, MA, the words, “Flashlight opens up the night” pop into my head. As I toss this phrase around in my head I eventually come up with the opening and closing of…something. A poem? A book? Nothing?? Oct. 7, 2014: With a hope and a prayer (and crossed fingers) I send the manuscript off to Rebecca Davis, the editor at Boyds Mills Press. Rebecca had seen some of my previous poetry but had not purchased anything up to this point. Before I email the manuscript to her, I change the title to Flashlight Night, so that there is no confusion with another book, Flashlight (Chronicle), which had just been published the week before I wrote my own flashlight book! How’s THAT for timing, huh? 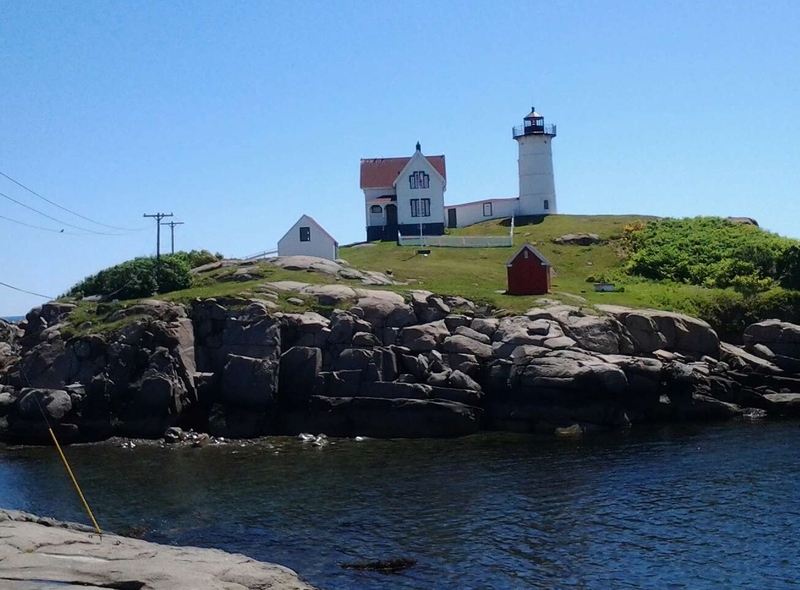 Dec. 2014: The Flashlight Night manuscript is awarded the New England SCBWI’s Peg Davol Scholarship for unpublished authors and receives a critique from an established, published author. Jan. 16, 2015: Five days after my critique, I receive a call from Rebecca, telling me she and her editorial board all love the manuscript. I am elated – not just because I had finally sold a full-length book manuscript, but because, had I followed the critiquer’s suggestions, the book would not be the book it is today. Indeed, it might not have even gotten published! May 18, 2015: I sign the contract for Flashlight Night! Fred takes a 2-week trip to the United Kingdom to sketch and photograph the countryside, the shipyard, the ocean, and museum artifacts in preparation. 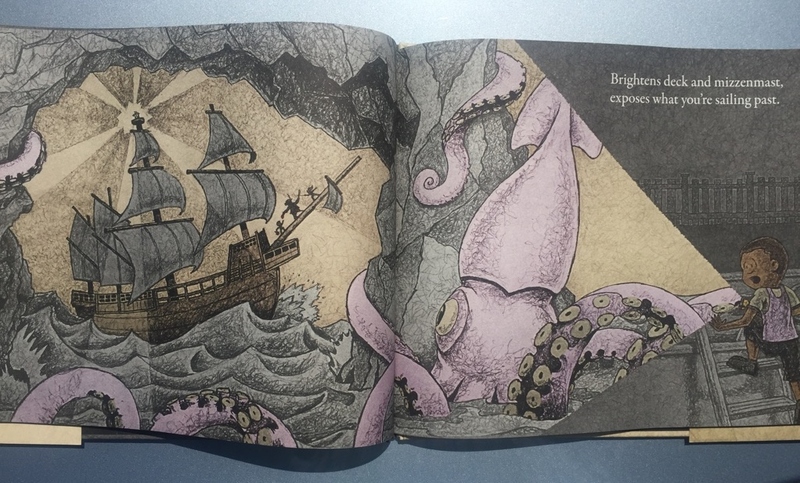 Much of what he sees – including the trail into the woods, the clipper ship, and the rocky arch where the Kraken hides – ends up in the book. I tell Fred that I should have taken the trip first, THEN written the book – what a sweet tax-write off! July-Dec. 2016: Dummies of the book continue to be put together and taken apart, revised and edited. By early Dec., we realize that my original ending,“all is still within, without,” is simply not going to work with Fred’s illustrations, so I change the line to “adventure lingers, stirs about.” (It’s called “collaboration,” folks!) By Dec. 14, we have what we believe is the final dummy version of the entire book, text and illustrations. April 12, 2017: F&G’s arrive. Short for “folded and gathered,” F&G’s are printed up following approval of a book’s final proofs. They look exactly the way the book will look once it’s bound, yet allow publishers’ marketing and sales teams to mail the books to buyers and trade journals without the heavy cover…shipping costs can get pretty hefty, as you can imagine! April-May 2017: Promotions get underway: full-page display ads in industry catalogs, inclusion in the Boyds Mills Press’ catalog…things are DEFINITELY getting real now. It feels like there is a new surprise everyday! May 26, 2017: We receive our first review, and it’s a whopper. 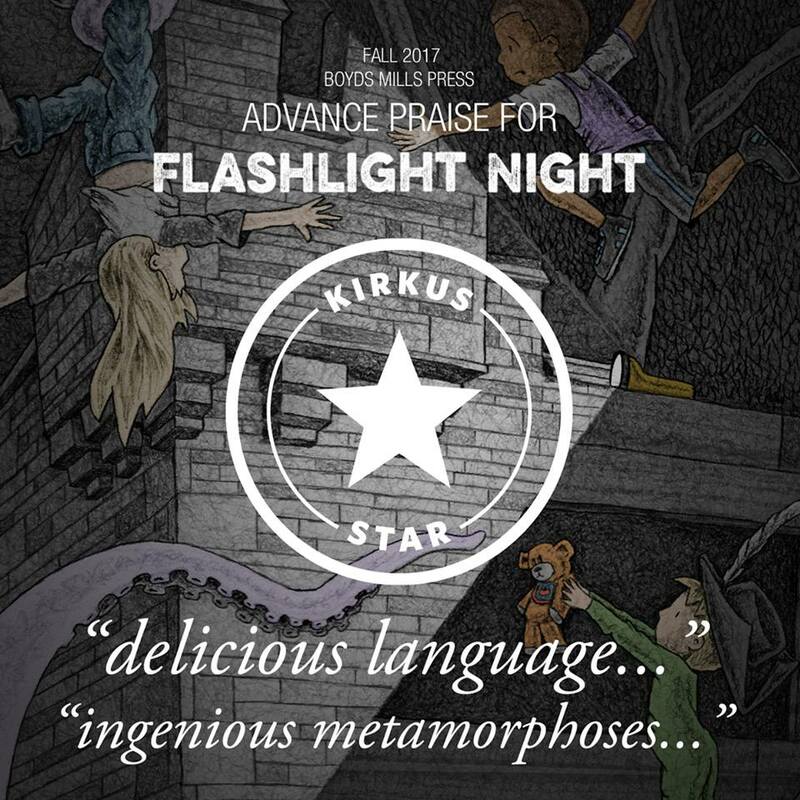 Kirkus calls Flashlight Night a “rousing read” and awards it a coveted Starred Review. As blown away as I am at this news…I am now eager to learn what others think of it! 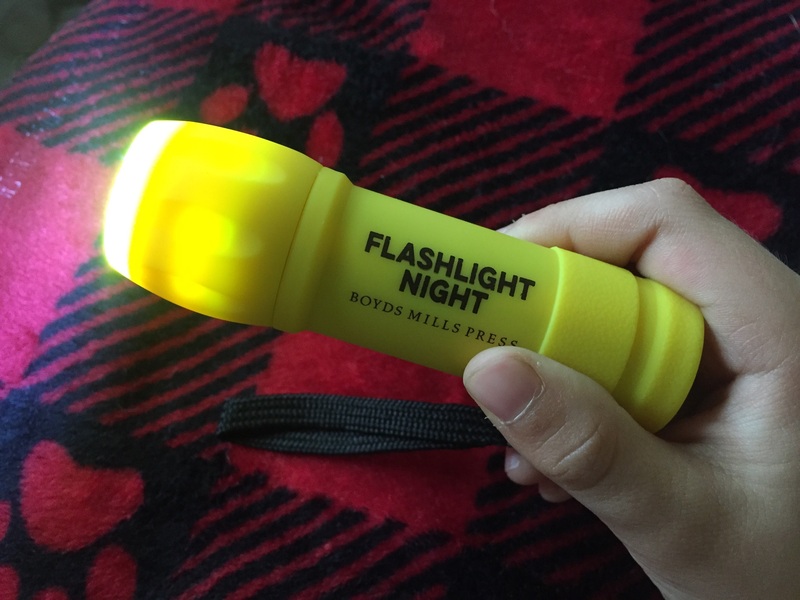 May 26, 2017: Flashlight Night flashlights arrive, to be distributed to librarians and book buyers across the country! Yes, May 26 was a good day. June 26, 2017: Two days after my birthday, my author copies arrive. It was the best non-birthday birthday gift ever, in the history of ever. Sept. 1, 2017: The School Library Journal reviews the book, calling the verse “incantatory.” The reviewer’s final verdict is glowing: “A simple idea that’s engagingly executed and would be an excellent, atmospheric read for sleepovers or backyard campouts. 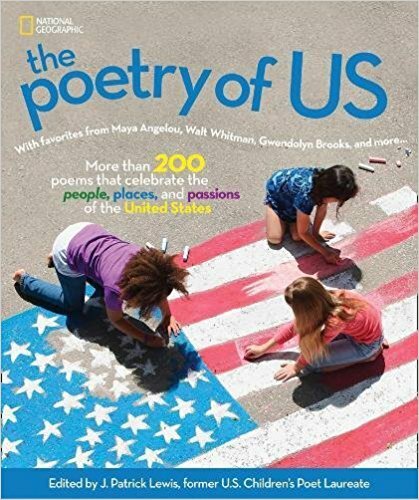 A good choice for most collections.” I’m particularly proud that the text is referred to as a poem…which is how it first came to be and the genre that got me into children’s writing in the first place. outside of Boston. Although the book doesn’t officially come out until Sept. 19, this date had been arranged earlier in the year, when we thought the book was going to be released earlier. It is a dual book launch with my friend and fellow author Carol Gordon Ekster, who was also celebrating the release of her new book. The event is well-attended, we sell lots of books, and I breathe a sigh of relief! It is the fist of many signings, and I can’t wait to continue the book tour throughout southern NH and northeastern MA. Sept. 19, 2017: Flashlight Night makes it debut in the world!! (And on International Talk Like a Pirate Day, no less – how more perfect could that be?!?) 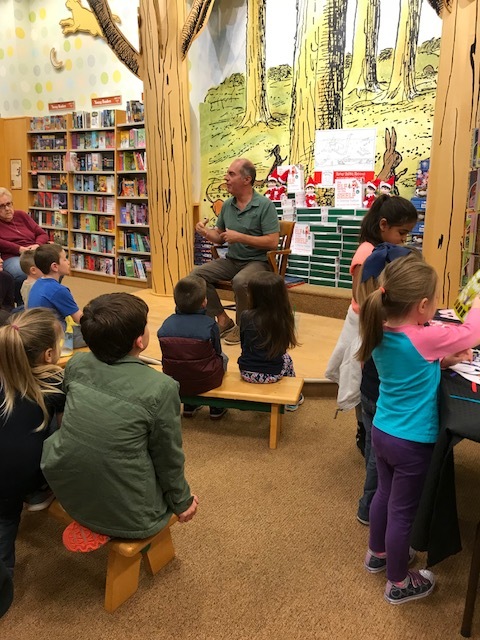 A huge blog tour helps support the promotional effort with interviews, giveaways, and lots of great press – including an appearance by Fred Koehler on KidLitTV. 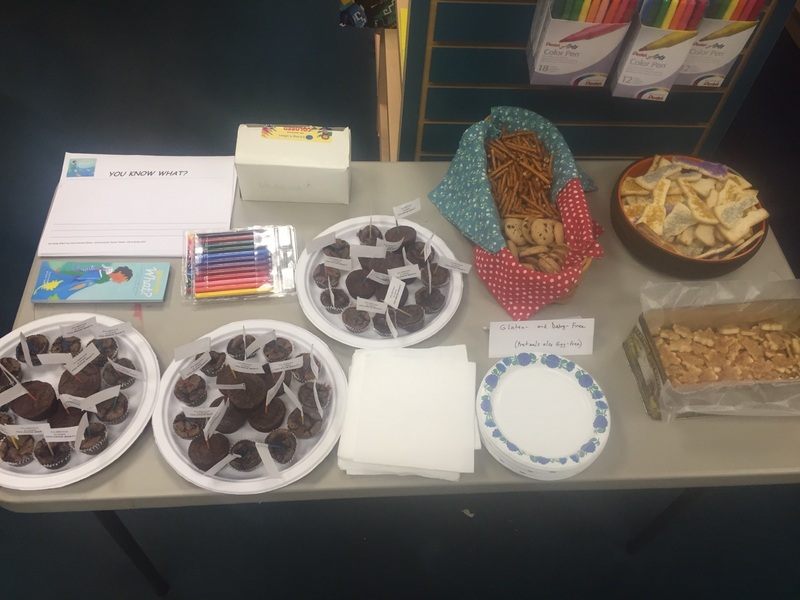 (Book signings, readings, and school visits, oh my!) More than THREE YEARS after I first started tossing words around in my head to create my story, anyone and everyone who wants to have a copy, can buy one anywhere. It still feels surreal. Sept. 26, 2017: Unbeknownst to the publisher, we receive a tremendously positive review from Shelf-Awareness, in which the reviewer compares our book – favorably! – to Maurice Sendak’s Where the Wild Things Are. Talk about compliments that can humble a person. was for an email blast for the online book retailer Mackin. With so many positive reviews, our publisher wanted as many potential customers as possible to see them. 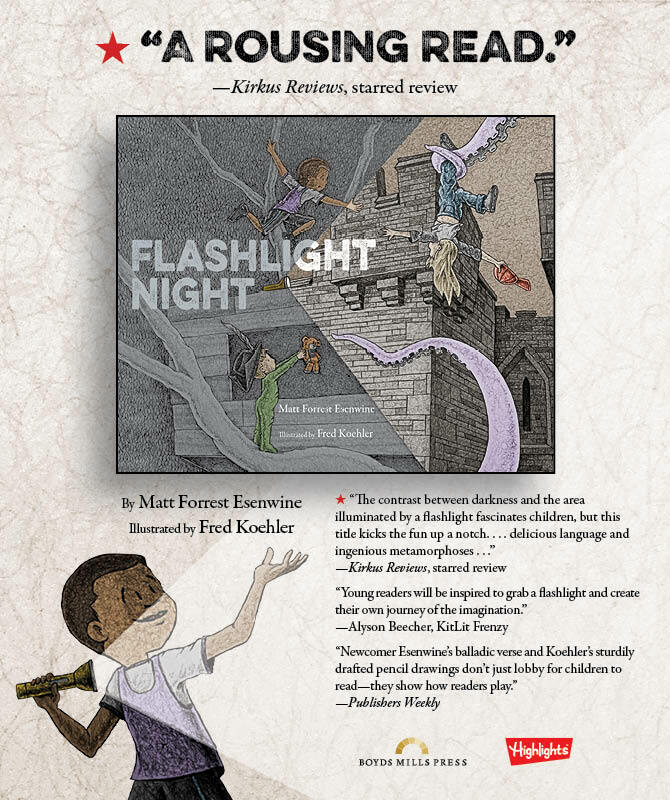 Nov. 2017: I discover that Flashlight Night is one of Amazon’s best-selling children’s books about libraries and reading…and my head swells a wee bit more. Dec., 2017: Another review and another (major) list! 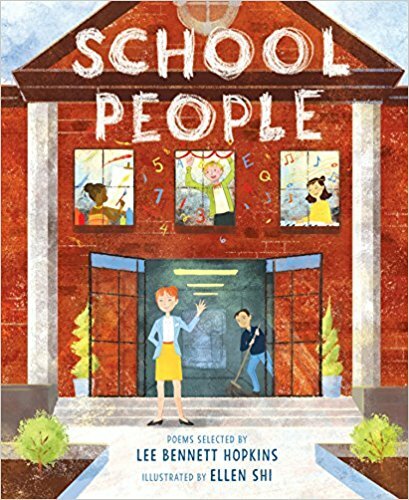 The review is by the School Library Connection, which also favorably compares the book to Wild Things, praising its “poetic rhyme” and “creative illustrations.” The list is the New York Public Library’s “Best Books for Kids 2017,” which also includes titles like Dan Santat’s incredible After the Fall (Roaring Brook Press) and the Margaret Wise Brown Prize-winning Things to Do (Chronicle Books) by my friend Elaine Magliaro. 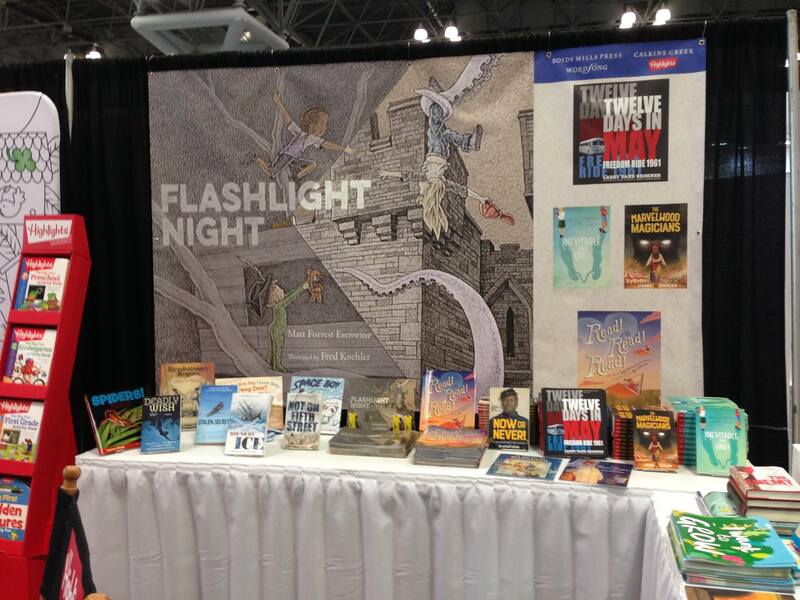 Shortly thereafter, Flashlight Night shows up as a NY Public Library Staff Pick, as well! Jan. 2018: Boyds Mills Press learns that the Kansas chapter of the NEA has selected Flashlight Night to be included in its 2018 Reading Circle Catalog, an honor I do not take lightly. We also continue discovering positive reviews from random kidlit, parenting, and educational bloggers, and I make a point to leave a comment on each one of them, thanking them for their support. 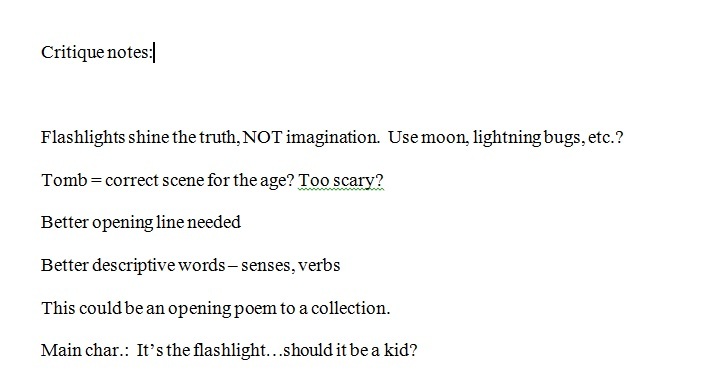 March 20, 2018: One of the aforementioned bloggers, author Jen Betton, uses Flashlight Night as mentor text for discussing the interplay of text and illustration. The fact that anyone would use something I wrote to teach others how to write is an indescribable honor. March 23, 2018: I deposit my very first royalty check! You see, many picture books don’t even make back the advance a publisher pays the author. To explain, an advance is against royalties; it’s like getting an advance on your paycheck. The publisher pays you up-front, then once you have sold enough copies to cover the advance, you begin receiving royalties. So the fact that we not only made back the advance, but made it back and then some within 5 months was astonishing. 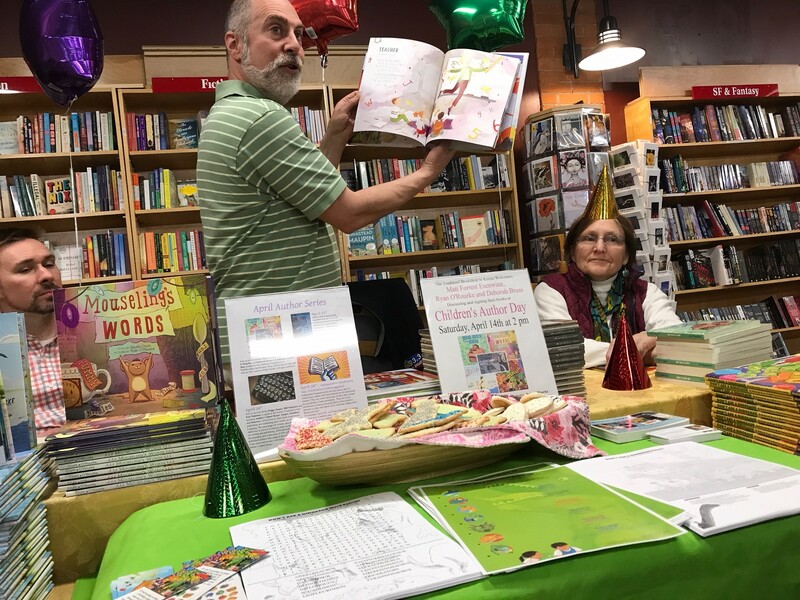 Keep in mind, compared to highly-successful, well-established authors like Jane Yolen and Mo Willems, I’m a relative unknown – so the book’s success is significant. I was so grateful to editor Rebecca Davis and Boyds Mills Press for taking a chance on Flashlight Night. Summer 2018: Our little book starts popping up on Summer Reading Lists! You can learn more at my blog post HERE. 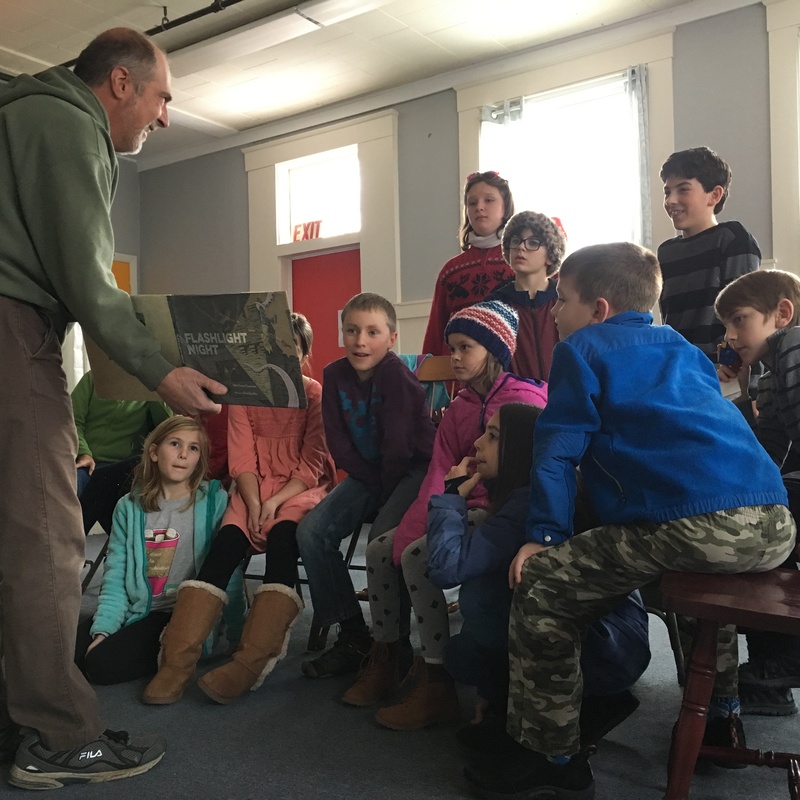 What’s next: The book continues to be discovered by parents, children, librarians, and teachers. I am always delighted when I see a new review or hear about the book showing up on a reading list. 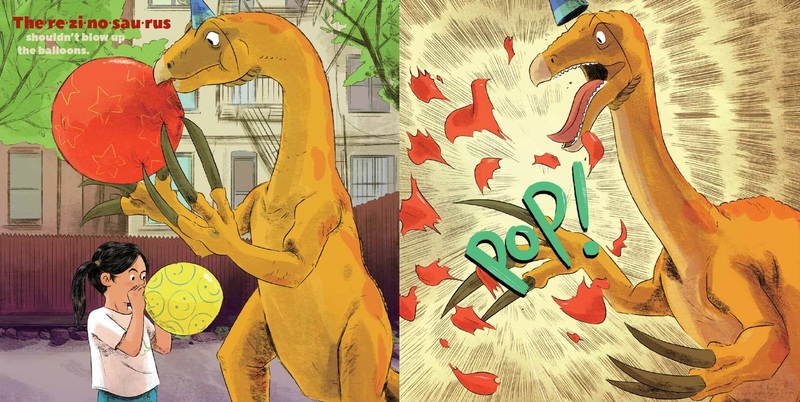 While I continue to do book signings for Flashlight Night, Don’t Ask a Dinosaur (Pow! Kids Books, 2018), and the poetry anthologies I’ve been a part of (see below for all the covers), I also love visiting schools to talk about the writing process, poetry, and how writing & illustrating go hand-in-hand when creating picture books. Thank you for following this blog and for supporting Flashlight Night. I never knew how many people would see it, read it, love it…and its success has made an immense impact on my life. I’m genuinely grateful to every single person who has read it, purchased it, shared it, or somehow promoted it. From teachers and librarians, to parents and bloggers, to book sellers and reviewers – there are just too many people to thank individually for their support. So please know that you are a part of this timeline I’ve shared – at every point along the way. And this goes beyond Flashlight and Dinosaur and all the other books yet to come. None of what I do can been accomplished without the help and encouragement of folks like you. And I hope you’ll remain a part of this author’s journey on which I embarked 8 years ago. Because I have a feeling we’re only getting started! where’s this GIVEAWAY you told us about?? Leave a comment below and let me know you’d like to be entered in the drawing! I’ll pick one name at random on Thursday, Sept. 27 and announce the winner on my Poetry Friday blog post the next day. Share this post on Facebook or Twitter! Just be sure to tag me, so I know…and I’ll pick another name at random on Thursday, Sept. 27. Leave a review on Amazon or Goodreads! Now, before you start talking trash and calling me out for fishing for compliments, let me state this clearly: if you don’t like Flashlight Night…leave a review, anyway! I am by no means offended by negative criticism. Not everyone likes every book. While most reviews have been positive, there are some readers who have been completely underwhelmed by our effort. And that’s ok; we can still get along. (Why you would want to leave a negative review in the hopes of getting a free copy is beyond me, but to each his own.) Out of all the reviews posted from today through Sept. 27, 6pm EDST, I’ll pick one name at random – and will leave a comment on your review, so you’ll know you won. So be sure to check your review on Friday, Sept. 28! 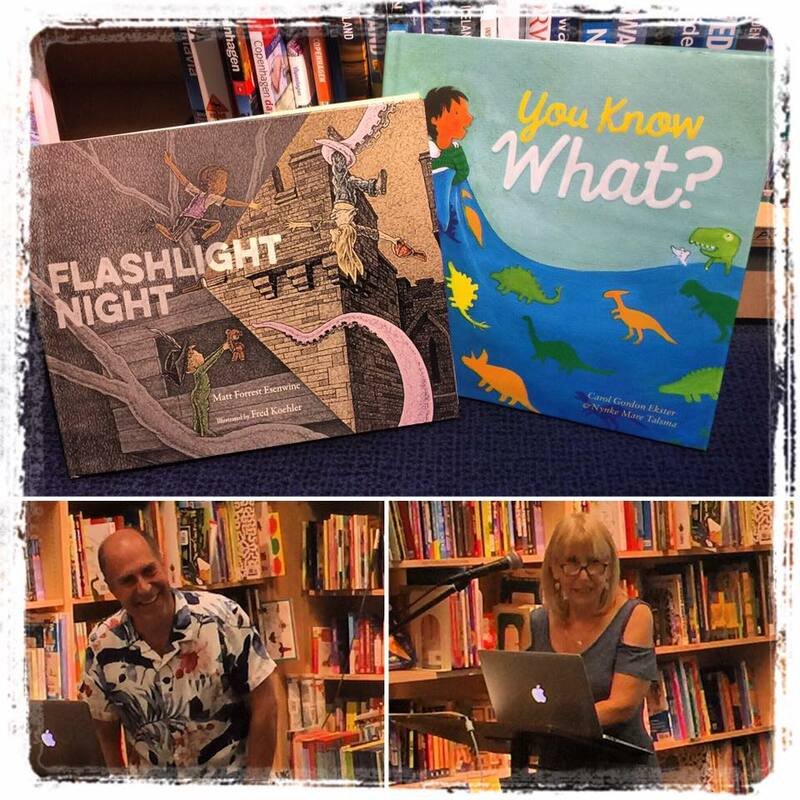 Oh, and if you’d like to have TWO MORE CHANCES to score free stuff, Laura Sassi is featuring an interview with Fred Koehler and Yours Truly on her blog today – she’s giving away a free signed copy of Flashlight Night AND a package of cool swag from the fine folks at KidLitTV! On flashlights, horses, and finding inspiration: A podcast w/Jessie Haas & Yours Truly, PLUS #pb10for10! 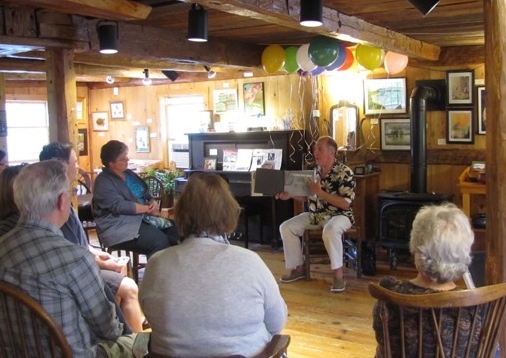 Earlier this summer, I had the opportunity to visit Toadstool Bookshop in Keene, NH for a book signing with Vermont children’s author Jessie Haas. While we were there, we were interviewed by Eric Rendering Fisk for his podcast, “The Fedora Chronicles” – and yes, he does, indeed, wear a fedora! Jessie Haas’ newest middle grade novel, edited by my “Flashlight Night” editor, Rebecca Davis! 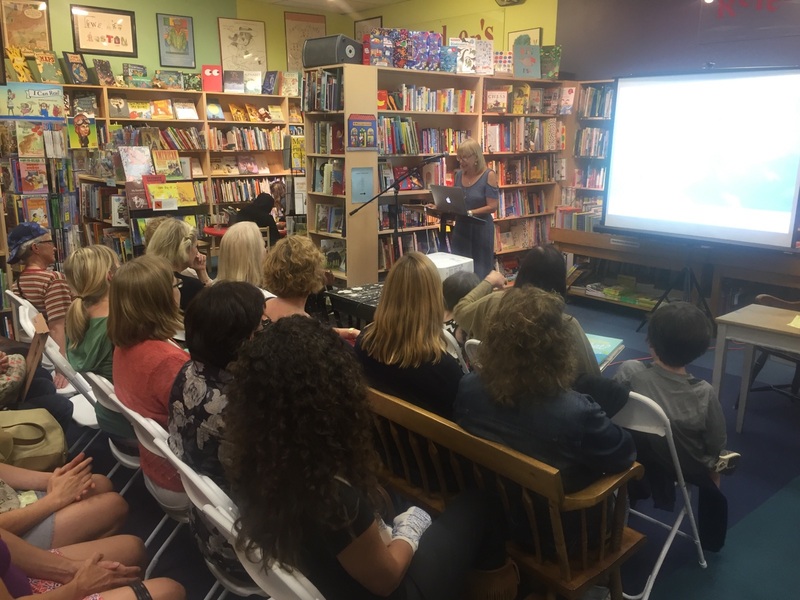 It was a lot of fun; Jessie and I talked about how we each got into the children’s literature industry, our thoughts on finding – and more importantly, creating – inspiration, and the fact that we both happen to share an editor (Rebecca Davis, at Boyds Mills Press). I learned last week that the podcast was finally edited and posted on Eric’s website, so I wanted to share the link here, in case you might be interested in listening. If you do listen, and enjoy it, I hope you’ll consider sharing it on Facebook, Twitter, or wherever your friends and acquaintances hang out! 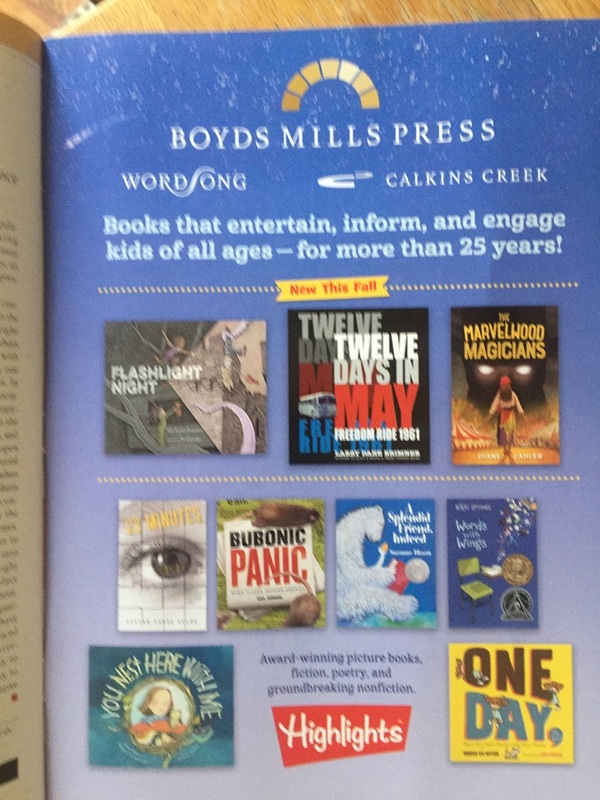 Also: I need to thank Catherine Flynn at Reading to the Core for including Flashlight Night in her Picture Book 10 for 10 List! If you’re unfamiliar with #pb10for10, as it is known, it’s a way for children’s lit bloggers, educators, and others to share their favorite picture books with others, usually done via a particular theme, such as books that inspire imagination, books that promote diversity, or whatever the list-maker chooses. 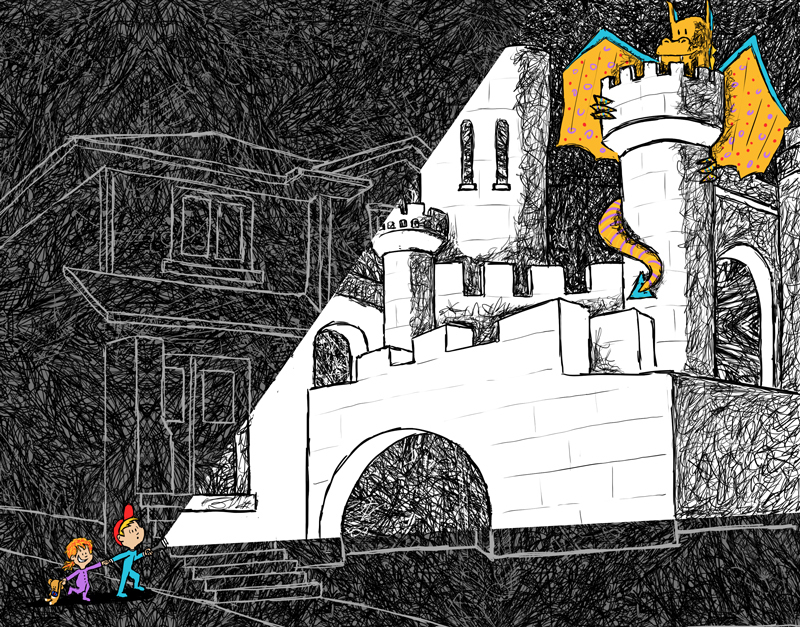 You can learn more about #pb10for10 HERE, and to find out more about Flashlight Night and my other books, just scroll down! 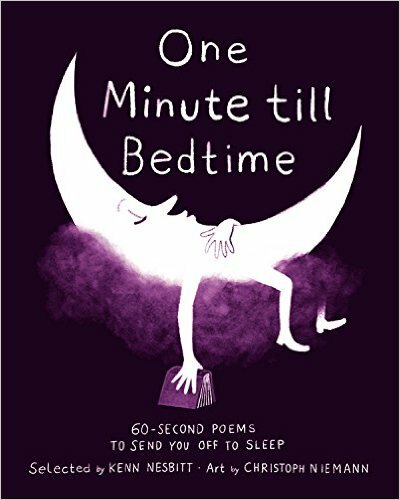 Poetry Friday: “The Best of Today’s Little Ditty, 2016” AND a new way to purchase my children’s books! You know how sometimes you get caught up doing one thing, and your focus prevents you from paying attention to everything else going on around you? Well, that happened to me a few weeks ago. 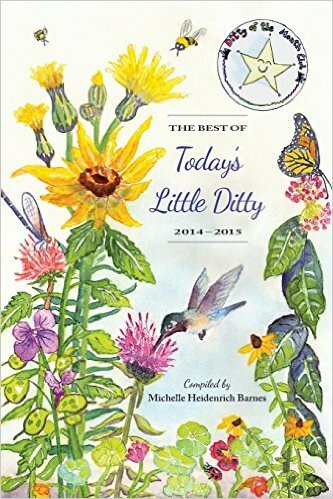 Shortly before Thanksgiving, friend and fellow children’s writer/blogger Michelle H. Barnes officially released her new poetry anthology, The Best of Today’s Little Ditty, 2016! And even though I helped select some of the poems (and even had two poems of my own included), I completely neglected to tell anyone! How much of a schmuck does that make me, huh? You see, I was in the middle of our #PoetryCubed challenge which we wrapped up last week, and it was only after I had announced our winner, Patty Richardson, that I realized my oversight. So let’s make amends right now, shall we? Michelle’s latest collection features 75 “Ditty of the Month Challenge” poems – that is, poems which were written in response to various prompts by such highly regarded children’s poets as Jane Yolen, David Harrison, Kenn Nesbitt, and many others, all of whom had been guests on her blog. Her first anthology of blog-inspired poems, The Best of Today’s Little Ditty 2014-2015, came out last year, so the fact that she had enough quality poems in just one year for another full-length book shows the level (as well as volume!) of writing one can find on her blog. just wanted to go home. Congratulations to Michelle and everyone who had poems included! 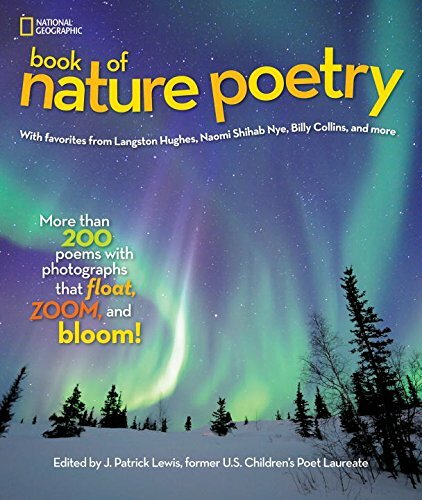 If you’re a fan of poetry – and not just children’s poetry, but poetry in general – I encourage you to pick up a copy. It’s truly amazing to see the vastly different reactions and responses writers had to each of these challenges. I also encourage you to visit Steps & Staircases, where you’ll find today’s complete Poetry Friday roundup, which includes a touching, powerful poem about grief which was inspired, in part, by…a Monopoly game piece. And of course, you’ll also find all of today’s poetry links, so please stop in! (ALSO: Please make a note to remind yourself to stop by here on Friday, Dec. 15, as I’ll be hosting a little online holiday party for everyone who loves children’s poetry! In other news: there’s a new way to purchase personalized signed copies of not only Flashlight Night, but ANY of my books or anthologies I’ve been part of! My good friends at MainStreet BookEnds in Warner, NH, a local, well-loved independent book store, have teamed up to present a very cool option for folks who don’t live anywhere near me, but still would like to have a signed copy of one of my books. They have ALL but one of my books available for ordering…and the best part is, you can get them personally signed! WHAT ARE FOLKS SAYING ABOUT “FLASHLIGHT NIGHT”? Poetry Friday: More #PoetryCubed entries AND we have a winner! I’m so excited I have more #PoetryCubed! entries to share today! We have a winner to announce, book signing news, and a special Flashlight Night review from Jan at Bookseed Studio! First up: #PoetryCubed! On The Food Network show “Chopped!“, chefs battle each other by creating dishes using specific, and sometimes odd, ingredients. 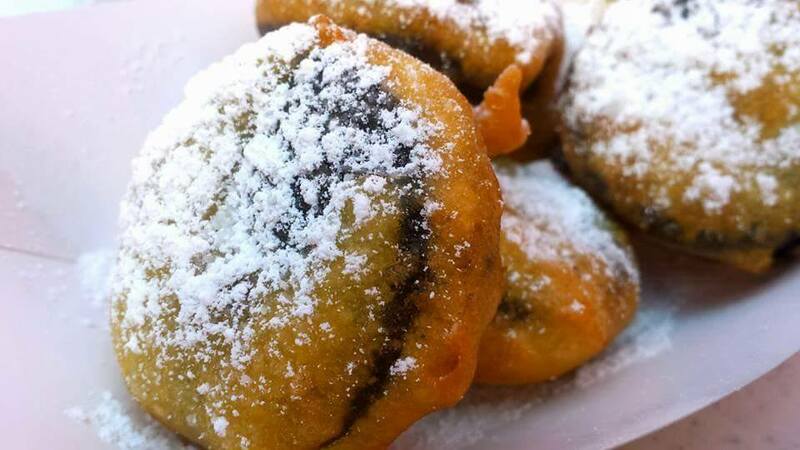 For example, contestants might have to create appetizers using radicchio, bologna, and kumquats, and then turn around and come up with entrees using prawns, pork belly, and Cheez Wiz. The poem could be any form, any genre, any number of lines, rhyming or not. And most importantly…it didn’t have to be very good! This was about having fun and stimulating a few brain cells; remember, #WriteLikeNoOneIsReading. The only hitch is that a reference to all three images in the poem needed to be included – either via concrete imagery or something more abstract. 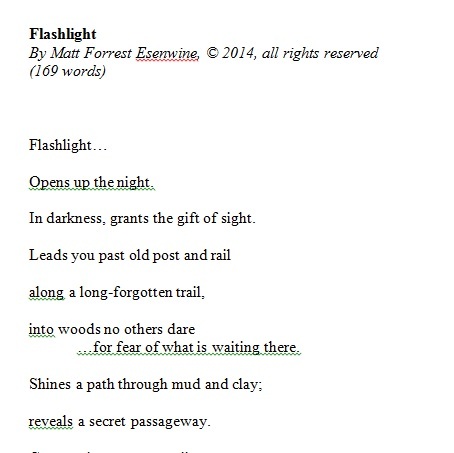 Out of all the poems submitted, one lucky writer would be chosen at random to receive a signed copy of Flashlight Night (Boyds Mills Press), just in time for holiday gift-giving! where no one really died. who only lived in legend. leaves tastes of home before we’re there. for Mom and Pop, our Christmas date. I have to say, these three images have been quite inspiring for a lot of people! 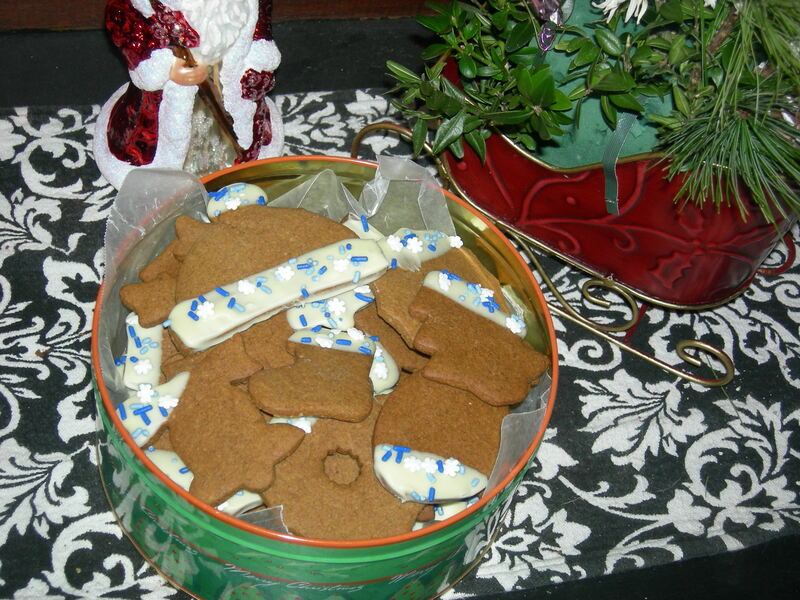 I started things off with a senryu, but we’ve also had haikus & rhyming poems, poems about vegetables, chocolate, and submarines, and even poems about hangovers, Christmas cookies, and the souls of the dead. I encourage you to click these links and read all the different perspectives and angles that our blog followers have embraced – all based on these three simple photos. Congratulations, Patty! (Patty told me she’s never entered this sort of challenge before, so I’m glad her leap of faith paid off!) 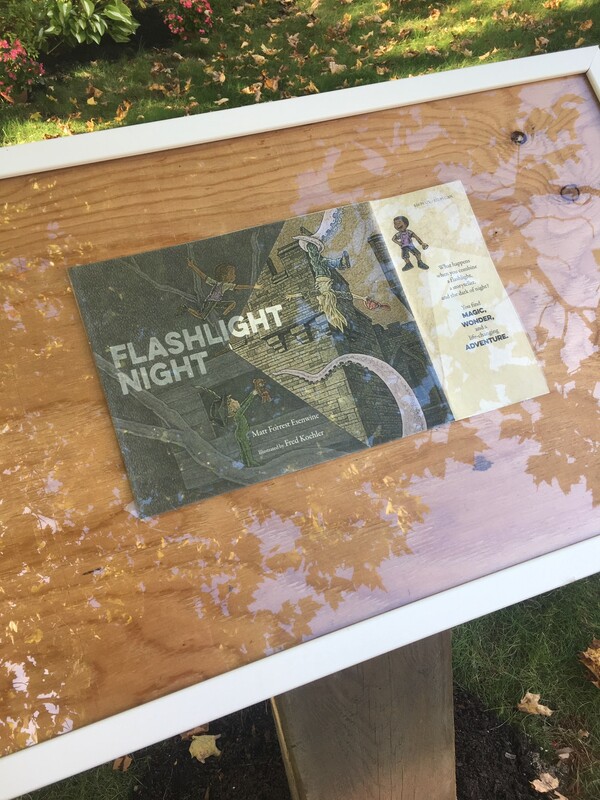 A signed copy of Flashlight Night will be in the mail and headed her way very soon…and thank you to everyone who took part! 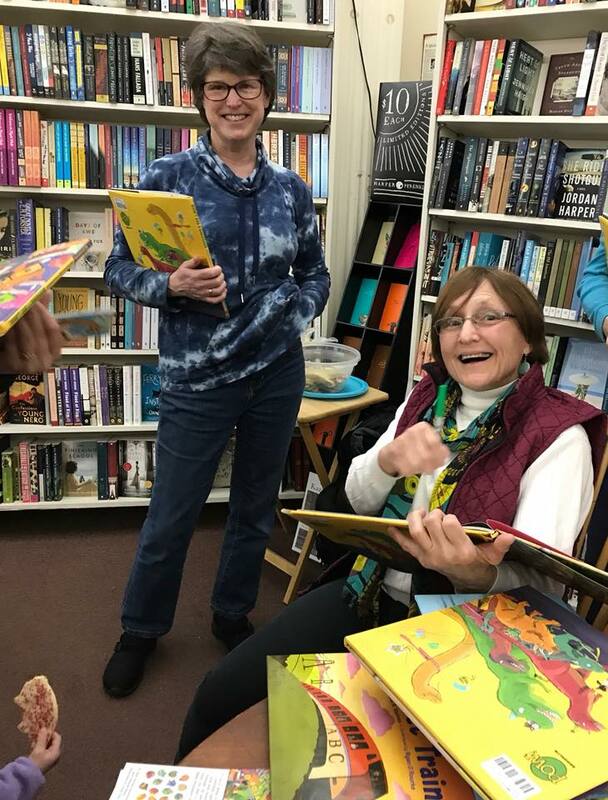 Speaking of Flashlight Night, Jan Godown Annino is sharing a review of my book at her Bookseed Studio blog today – and it appears she enjoyed it! 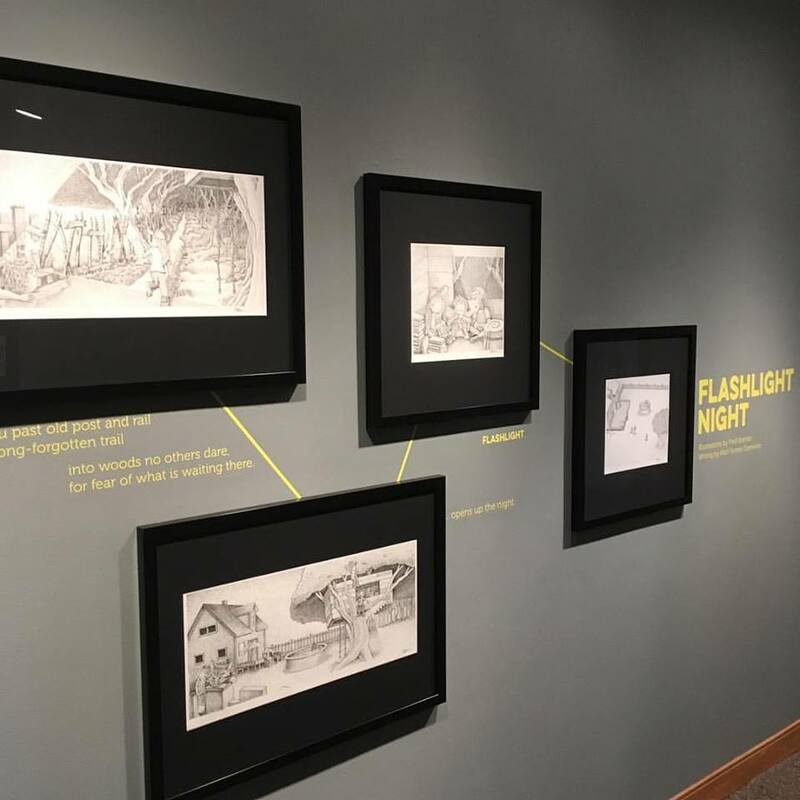 She asked illustrator Fred Koehler and me to share a little childhood background; where we grew up, what we did, how our young experiences helped create this little adventure we call Flashlight Night. I do hope you check out her post! I also encourage you to visit Mary Lee Hahn at A Year of Reading for today’s complete Poetry Friday roundup. Will there be cookies? Oh, yes!! The “Flashlight Night” road tour continues! I’ll continue revising this as dates are added or times are changed…so please check my FB page for any last-minute updates! Before we get to poetry or book signing schedules or anything like that, I need to take care of some business…by announcing a WINNER! 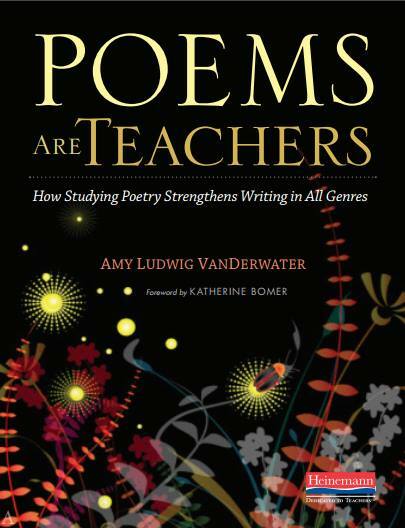 Last Friday, Amy Ludwig VanDerwater and her Poems Are Teachers publishing company, Heinemann, were kind enough to offer a free copy of the book to one of my blog readers. Congratulations, Kristen! Thank you so, so much for following my blog and connecting on Twitter – your book is on its way, direct from Heinemann! 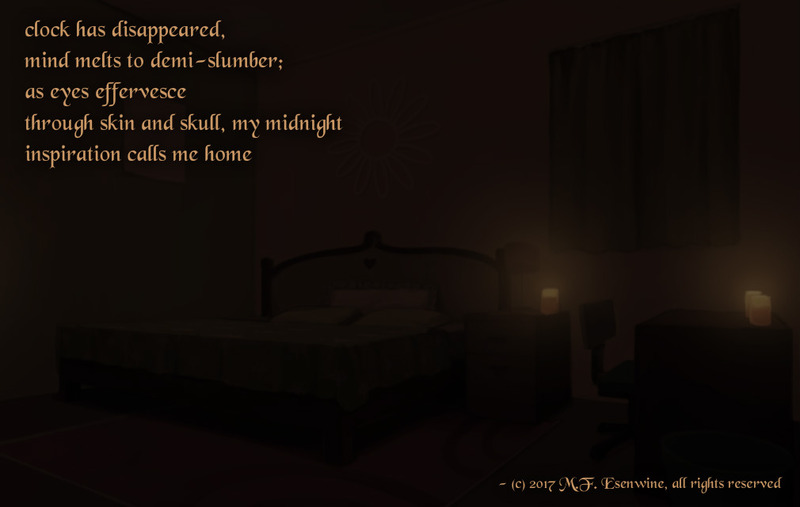 Yep, a tanka about falling asleep while trying to write. No idea where that came from, huh?? By the way, my friend Brenda Davis Harsham is hosting Poetry Friday today at her blog, Friendly Fairy Tales – and I know she definitely has some Halloween-inspired poetry to share, even if Yours Truly failed on that account! I’m also excited to be spending Poetry Friday at Barnes & Noble in Manchester, NH tonight at 6, as I take part in a benefit to raise money for Ste. Marie Child Care in the Queen City. If you’re in the area, I hope you’ll stop by and get a book signed! It’s official: Flashlight Night is finally here – on National Talk Like a Pirate Day, no less! 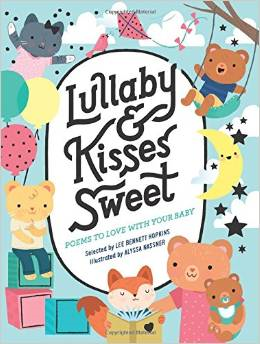 I’ve had lots of adult and children’s poems published in anthologies, journals, and such…but this is my first full-length picture book, and I’m so thrilled and humbled by all the coverage and positive reviews it’s been receiving. I am doubly pleased that so many folks – reviewers, average readers, and even illustrator Fred Koehler himself – have referred to my text as a “poem.” Because even though it’s a picture book (and I wrote it to be a picture book), I have always considered it poetry. Starting with Jama Kim Rattigan this past Friday and continuing through next Tues., various kidlit blogs have joined together to celebrate the arrival of my little baby. Today, Penny Parker Klostermann is featuring a guest blog by Yours Truly in which I talk about how the book came to be, as well as some of the things I deliberately did which I was afraid might hinder my chances of getting published. 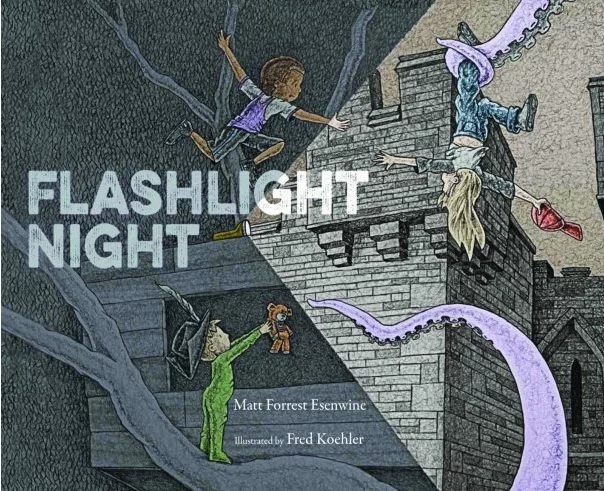 A few weeks ago,the folks at KidLit TV interviewed Fred about his work on Flashlight Night (as well as his amazing talent in general), and today they’re sharing it on their website! Click to enlarge Fred’s version of Durdle Door! …and the Goodreads Giveaway has begun! My publisher, Boyds Mills Press, has teamed up with Goodreads to give away TWENTY COPIES of Flashlight Night! The contest started at midnight last night and will wrap up at 11:59pm PT next Tue., Sept. 26. So head on over and enter…and good luck! I’ll be sure to let you know when and where I’ll be as soon as I know where I’ll be! Thank you so much to all who have enjoyed the book enough to write about it! Thank you, as always, for your support…if you decide to pick up a copy, I hope you and your kids enjoy it as much as Fred and I – along with editor Rebecca Davis, of course – have enjoyed creating it! 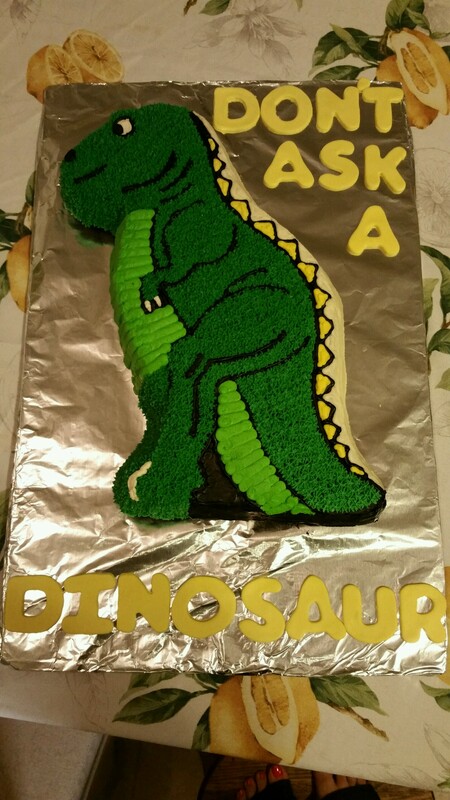 Poetry Friday: Flashlights and Dinosaurs and Roundups – oh, my! Where to begin, where to begin, where to begin…it’s such a crazy, busy week, and there’s so much to talk about! 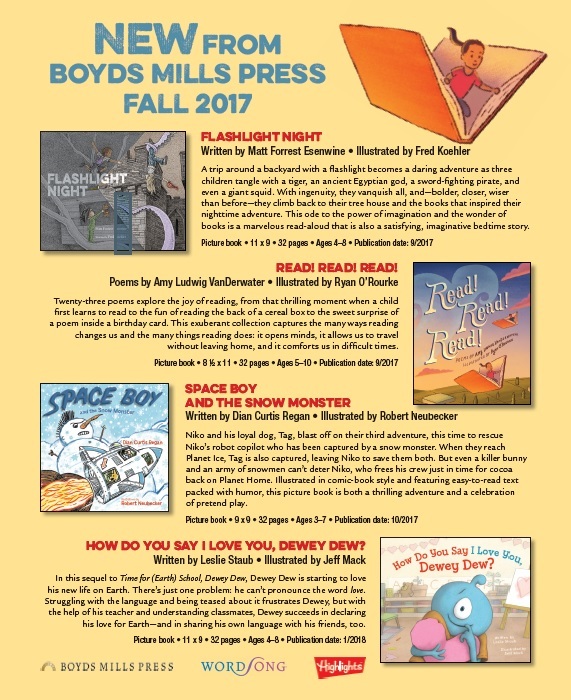 I have big news about my debut picture book, Flashlight Night (Boyds Mills Press, Sept. 19, 2017) – actually, THREE different news items – plus, news about my second book, due out this spring. But first, let me welcome you to the Poetry Friday roundup! This is the place where you can find links to all of the poetry-related posts in the blogosphere. So leave your links in the comments below, and I’ll put them together in this post throughout the day. 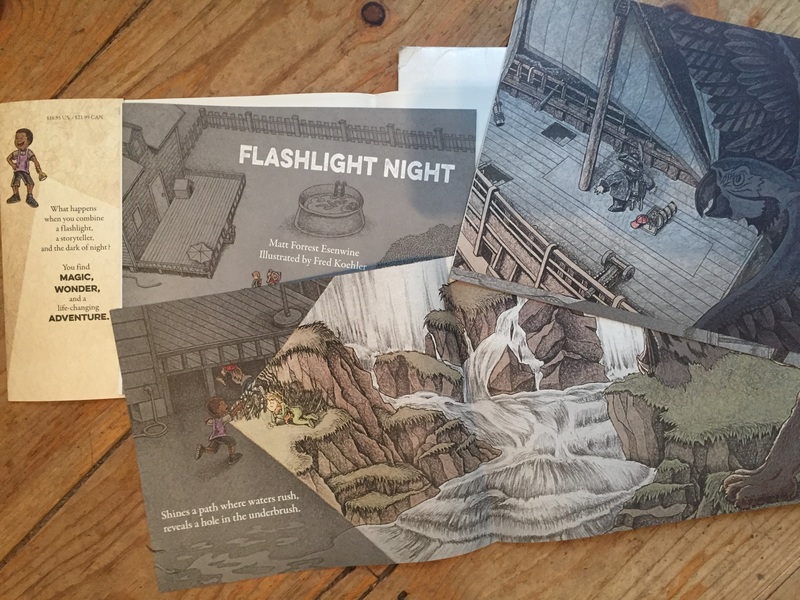 “Flashlight Night” News #1: National Book Launch! 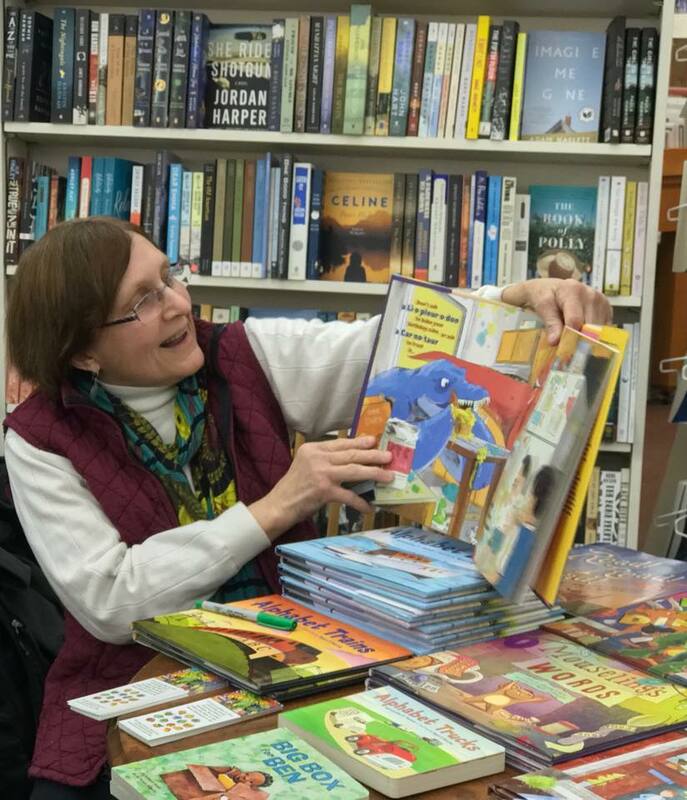 Last night, Carol Gordon Ekster, whose new picture book is You Know What? 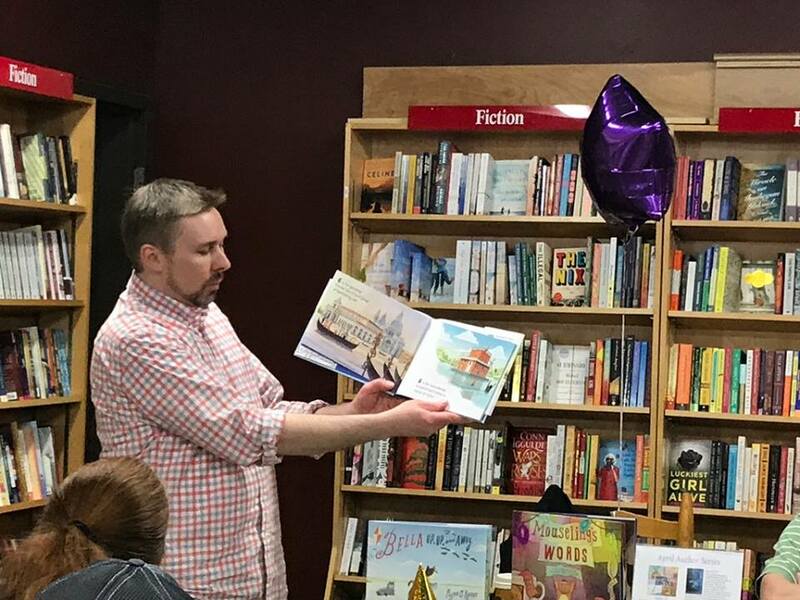 (Clavis, 2017), and I hosted a dual book launch at Porter Square Books in Cambridge, Mass. What a success! Loved the size of the crowd! “Flashlight Night” News #2: One of the Best Picture Books of 2017! Last Friday, the folks at The Children’s Book Review announced their list of what they feel are the best children’s books of the year…and Flashlight Night made the cut! I’m so excited about this, not only because I wrote it, but because it was such a beautiful example of teamwork – between me, illustrator Fred Koehler (who came up with the concept of reality being in darkness and fantasy being illuminated by the flashlight), and my editor, Rebecca Davis, who steered the project from start to finish. And just in case you missed that link, here it is again, so you can read the complete list – which includes books from friends and fellow writers like David Elliott, Josh, Funk, Patricia Toht, and many others. “Flashlight Night” News #3: On sale at Amazon! I always like to books locally, whenever possible, because doing so helps support the businesses closest to us. But if you really want to pick up a copy and are having a tough time with your finances, I am please to tell you that Amazon has it for almost five dollars less than the standard price: just $12.11! Second book news: COVER REVEAL! 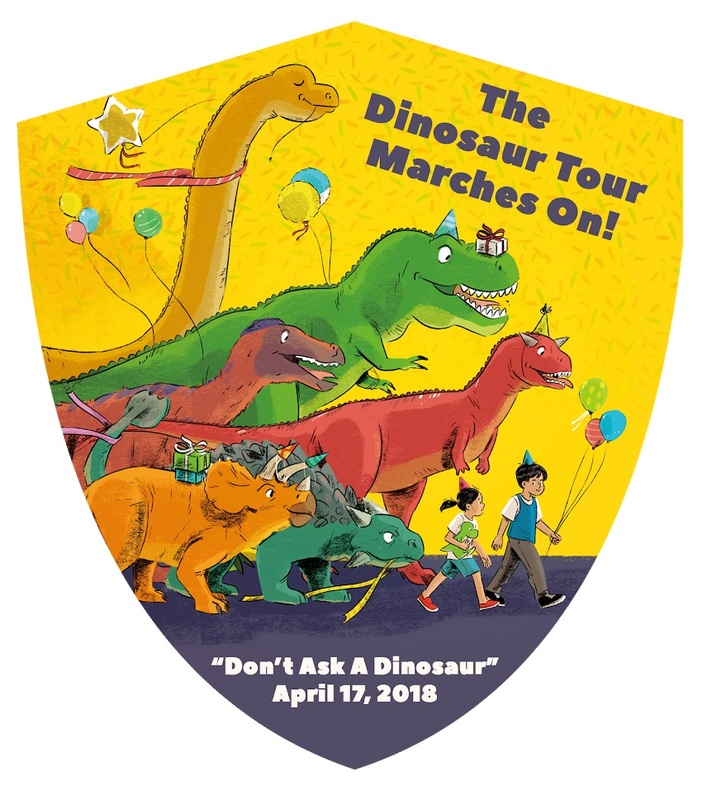 In the midst of all this Flashlight news, I learned something about Don’t Ask a Dinosaur (Pow! Kids Books, March 2018), the book I co-authored with author & critique partner Deb Bruss…we have a release date and a cover! Wait til you see what’s inside! 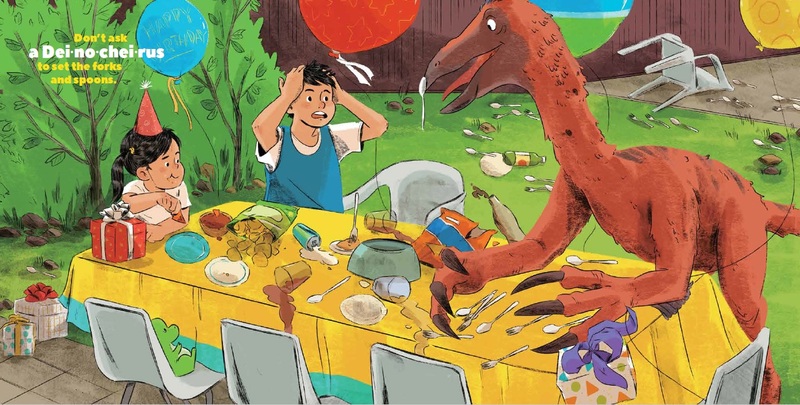 Illustrator Louis Chin is having fun depicting 14 different dinosaur species and the utter havoc they wreak while getting ready for a birthday party. 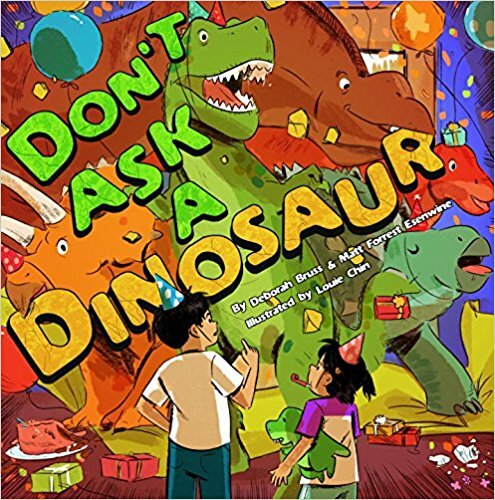 With big, bold colors, crazy situations, and a 2-page glossary at the end detailing the unique attributes of each dinosaur, this book is completely unlike Flashlight – so I’m eager to see what people think of it! It’s already for pre-order, so CLICK HERE for details. Local release party this weekend! Just a reminder: if you’re in the area, please stop by MainStreet BookEnds in Warner, NH this Sunday for the local release party, starting at 2pm. More info can be found HERE. My friends Charles Waters and Irene Latham have a release date AND cover reveal for their co-authored book (Charles’ debut!). Irene also shares a sneak peek at one of the poems from their book on her blog. Carol Varsalona is waxing poetic as kids are going back to school. Rebecca Herzog is prepping for Irma, but found time to write a poem – and this may be the only time in history that Jane Yolen, Dr. Seuss, R.L. Stine, and litle ol’ me have been mentioned in the same breath! Michelle Kogan offers a villanelle for humanity – and with everything going on these days, it’s just what we need. At Gathering Books, Iphegene shares a beautiful poem she wrote for the Summer Poetry Swap. Kathryn Apel shares 4 new poems inspired by her sons – on subjects from paper airplanes to toadstools! At Today’s Little Ditty, Michelle is spotlighting the new book from Janet Wong & Sylvia Vardell – and celebrating with a giveaway! Linda Mitchell finds inspiration in Motown, with an abeccdarian poem that’s also a found poem AND book review. 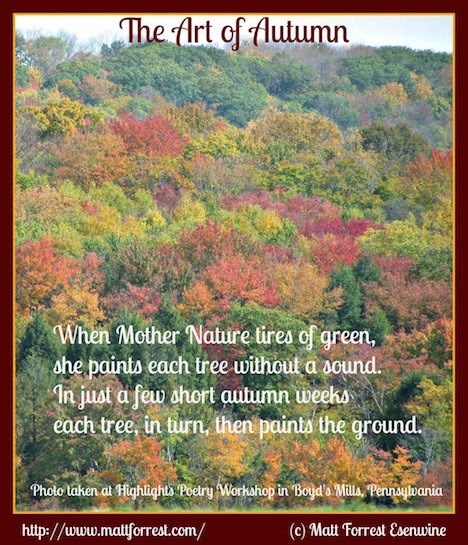 Catherine Flynn, meanwhile, was inspired to write a short, colorful poem after reading Susan Goldmsith Wooldridge. At The Poem Farm, Amy shares a project she did with the Buffalo Philharmonic Orchestra this summer, and is preparing to launch her new poetry collection! Mary Lee Hahn ‘ducks’ inspiration while riding her bike. At Whispers from the Ridge, Kiesha is encouraging readers to find balance in their lives and to live in the present. At Reflections on the Teche, Margaret is also sharing a Kenyon poem – one of my favorites! Brenda Davis Harsham refuses to let summer go! She’s in today with a rhyming haiku. Linda at Teacher Dance takes our minds away from hurricanes and forest fires and world unrest with two poems from the Summer Poetry Swap. Likewise, Kay McGriff turns away from the news and is reflecting on dreams by sharing a Langston Hughes poem. 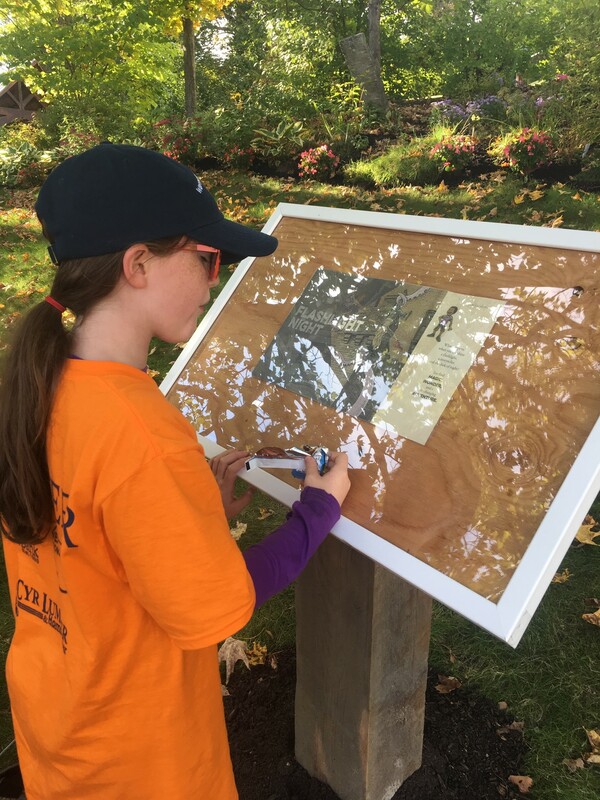 After a local park was vandalized, Violet Nesdoly found inspiration! At Bildungsroman, Little Willow shares a thought-provoking, almost surreal poem by Joanna Fuhrman. Jane, the Rain City Librarian, has autumn on the mind with a Japanese poem about fall. 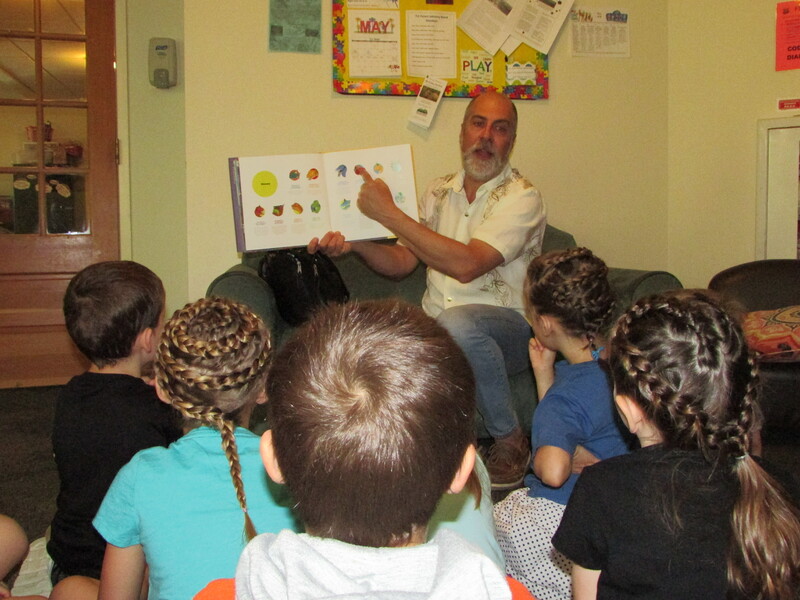 At Poetry for Children, Sylvia Vardell has a guest post from author René Saldaña, Jr., who shares insights on teaching, writing, and the lessons he has learned! Karen Edmisten offers up a nature poem by Gillian Wegener that is about much more than just nature. While searching her files for a hurricane-related poem, Diane Mayr discovered an abecedarian hurricane poem, perfect for Michelle H. Barnes’ monthly writing challenge! Meanwhile, at Kurious Kitty, Diane shares a poem from Jeane Steig’s 1988 collection, Consider the Lemming. Catherine at Wondering and Wandering shares kindergartners’ love of poetry with us…something that’s so nice to see! Penny Parker Klostermann is back with another edition of her Great Nephew / Great Aunt series of illustrations and poetry! Last but certainly not EVER least…I just learned that Jama Kim Rattigan’s blog, Alphabet Soup, is 10 YEARS OLD! Happy birthday, Jama! Of course, she is celebrating with cake (and tea, I’m sure) – and offers a look back at why she began blogging and how far she has come. Sadly, she is in a difficult predicament, which she elucidates in her post – so please stop by and wish her well! Flashlight Night (Boyd’s Mills Press) hits bookshelves Sept. 19, 2017! Pre-orders are available now through Barnes & Noble, Amazon, or Books-a-Million, or by clicking the image of the cover to the right. Of course, if you prefer, you can always wait til Sept. 19 and purchase it at your favorite local independent bookstore.